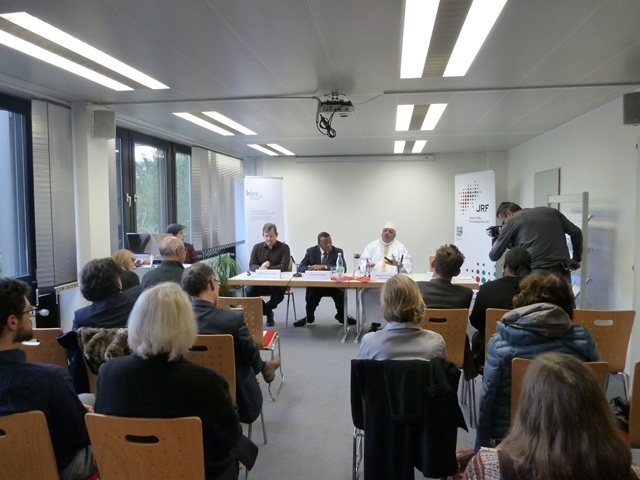 Between 14-18 December 2015, BICC hosted two high-level delegations – one Malian and one Nigerian – during a week-long visit to Berlin and Bonn. The delegations were led by His Excellency Mr. Zahaby Ould Sidi Mohamed, Malian Minister for National Reconciliation, and Ambassador Emmanuel Imohe, Chairman of the Nigerian Presidential Committee on Small Arms and Light Weapons and President of the 2016 ATT Conference of States Parties. The delegations conducted joint and individual visits to the German Federal Foreign Office, attended a lunch with German members of parliament, and spoke jointly at a BICC roundtable on current conflict dynamics in the Sahel. During this roundtable Ambassador Imohe presented existing regional and sub-regional efforts to combat SALW proliferation in the Sahel, while Minister Zahaby touched upon the role of political Islam in the mobilization of combatants in Mali and the wider region. 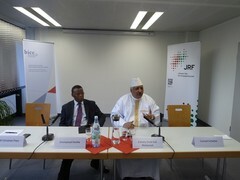 The Malian Minister Zahabi also attended a roundtable jointly organized by BICC and the Working Group on Peace and Development (FriEnt) in Berlin, where he discussed current weaknesses in the implementation of the Algiers Peace Accord and his work on national reconciliation.